It’s official: My first Cotopaxi backpack has replaced my decade-old, cat-scratch-covered, obnoxiously red carry-on suitcase. You know, the kind of luggage that rolls not-so-gracefully over bumpy surfaces, won’t properly stand up because one of the feet is broken off, and is annoying to pack because of that metal bar in the bottom. As wonderful as it felt to say goodbye to that old thing and embrace the functionality of a backpack-meets-suitcase “travel pack,” I was still craving something bigger than the Nazca 24L that I wrote about earlier this year. 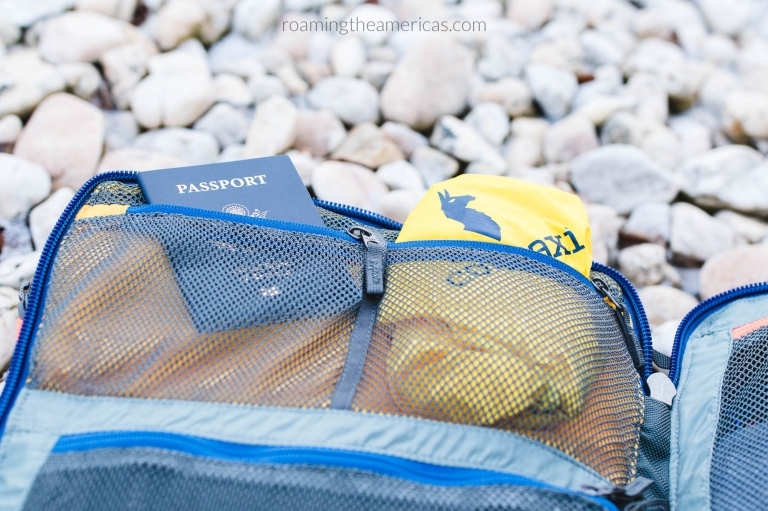 I needed something that I could use for longer trips–a durable backpack that would be versatile enough for international flights, road trips to Maine, and camping adventures. 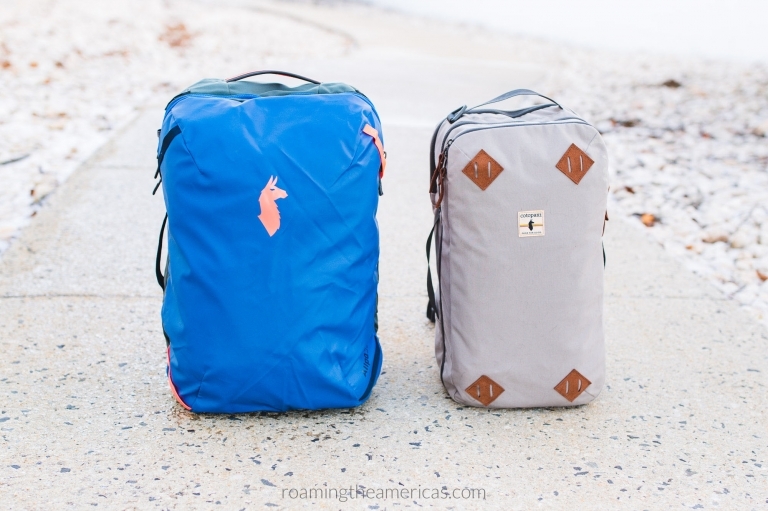 Enter the Cotopaxi Allpa 35L Travel Pack. This is the stuff Type A dreams are made of, my friends. I was pretty stoked when I heard that Cotopaxi was releasing a “big sister” to the Nazca backpack earlier this year, as I’ve quickly become obsessed with these Cotopaxi bags. The Allpa backpack was launched through an Indiegogo campaign, and Cotopaxi managed to smash their goal of $50K–raising over $1.3 million to kick off production. Crazy! I’m excited to finally have my hands on one, and I’m excited to share my thoughts with you after having road tested it. 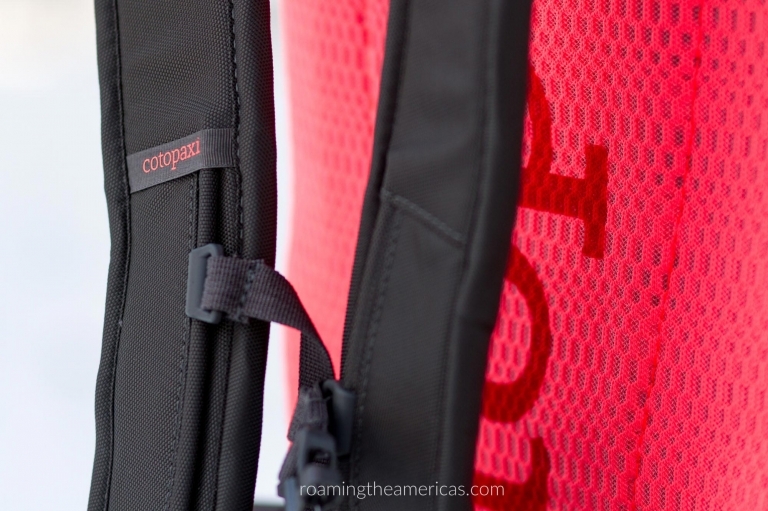 In this Cotopaxi Allpa 35L review, I’m sharing a breakdown of the features, a sneak peek inside with my unboxing, what I like, and what I might change. Disclosure: Many thanks to Cotopaxi for sending me a sample of the Allpa 35L so that I could share it with you. As I mentioned in my post about the Nazca 24L, I’ve been following them for quite some time and love what they’re all about. Although this product was provided free of cost, I was not required to write a positive review. All opinions expressed are my own, and I’m always committed to bringing you genuine content with real facts, photos, and thoughts. Cotopaxi goes beyond making great travel and adventure gear with their Gear for Good philosophy. In addition to funding sustainable poverty alleviation with a portion of their profits, they also ensure fairness, sustainability, and quality in every step of the manufacturing process. This video gives a good background about how they got started and what they’re all about (and it makes me think we should all head to a cabin in the mountains every once in awhile). This Is Cotopaxi. This Is Gear For Good. from Cotopaxi on Vimeo. Here’s a packing demo from a one-week trip to Maine that shows everything I fit inside, plus some of the accessories. Okay…so let’s get to the good stuff already. What do I think of Cotopaxi’s Allpa pack? I haven’t flown with it yet (I’ll be updating this post as I take more trips), but I’ve taken it on a road trip and so far, I’m enjoying it. Solid, sturdy design: The material is really durable and I know it’s ready for adventures. And…it’s not dog-hair-attracting–for the win! The zippers are hefty, too. Of course, time will be the test in terms of quality, but the build and quality feel rugged. Plus, Cotopaxi guarantees their products for 61 years (the average lifespan of a person living in the developing world), and they offer a replacement, repair, or exchange if anything goes wrong with the product. Spacious: I’m so glad to have this bigger version of the design I fell in love with in the Nazca. The main suitcase side is really roomy and deep, as is the front pocket (it’s DEEP). And it’s got compression straps, which the Nazca doesn’t have, to help you fit even more inside. I was able to comfortably pack for five days on a recent road trip during the winter (though admittedly, I did have some “extras” that came along in the car because I was visiting family for Christmas). Theft-prevention zippers: I don’t know if that’s the official term for this zipper design, but that’s what I’m calling them. The laptop sleeve, main compartment, and back access have a loop that the zipper has to pass through, which helps prevent easy access. Organized and convertible design: I love the organization factor with various zippered compartments. There’s a zippered access from the back of the pack that lets you get into one side of the main compartment without having to open the entire pack. I can see that this could come in handy (as long as you packed intentionally), but I haven’t needed to use it yet. The convertible design that lets you carry it like a backpack OR a suitcase (with backpack straps that tuck away), and the fact that it’s not top-loading like a traditional backpack, make it really flexible and convenient. Extras: I love the accessories that you can get with it, especially the size of the Batac Del Día daypack. It’s such a perfect size for day trips and short adventures–I’ve even been using it to take to the gym while I’m home. The water bottle sleeve is really nice as well, and it comfortably fits my 32-ounce Healthy Human water bottle. I’ve also found the shoe bag and mesh laundry bag to be handy (because I’m always searching around for plastic bags for this stuff, but trying to stop using them as much as possible). Padded laptop and tablet sleeve: Always helpful when you need to minimize the number of bags you’re taking on a trip. Cotopaxi’s “Gear for Good” philosophy: Can I just say again how much I love this? Rain cover: Technically, this is mostly a “pro,” given that having a rain cover while traveling is so helpful, and the Allpa comes with one automatically. However, I’m curious about whether Cotopaxi considered making this built in (this is a feature on my Lowepro DSLR camera bags), as that is something I could see making it even more convenient. The major benefit of having it built in is that you can’t lose it or forget it. It also wouldn’t take up space in one of the compartments. And, you don’t have to remember how to fold it (am I the only person who takes a photo of her tent so I know how to pack it back up?). On the other hand, not having it built into the bag itself could be convenient if you’re trying to save every last bit of space and weight possible and don’t need to take it with you. My attempt at re-folding the rain cover! Waist strap is bulky to tuck away: I found that the straps (mainly the waist straps) don’t tuck away as easily as they do on the Nazca pack (they’re more hefty, which is beneficial in other ways). As a little bonus tip/”don’t do what I did”: I had a bit of trouble when packing because I packed the big compartment full of clothes, tightened up the compression straps, added a couple other things…then tried to put my laptop in the sleeve, and it wouldn’t zip. I think it’s not so much of a design “con,” but just make sure to watch how you’re packing if you use the compression straps in the main compartment. 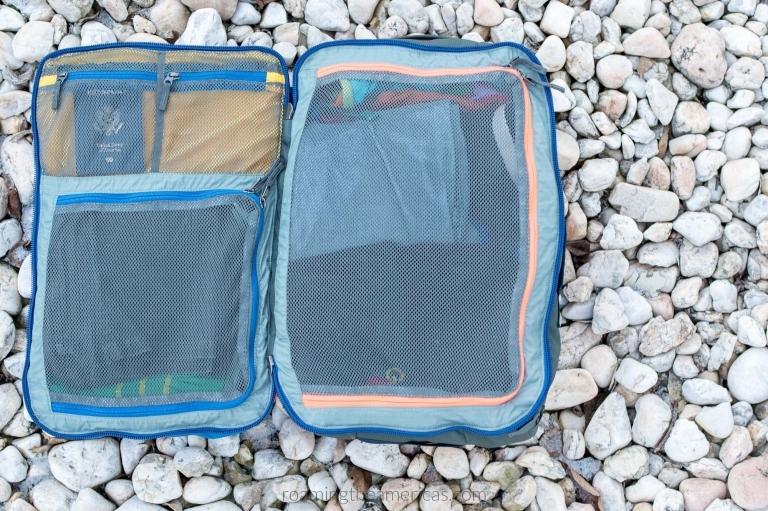 Depending on weather, clothing size, and packing style, the Allpa 35L can be easily used for weekend trips or longer, and is spacious enough for a week or more if you’re a light packer in warm weather. Overall, I highly recommend the Allpa 35L Travel Pack for anyone looking for a spacious travel backpack with an organized design that fits carry-on restrictions. Check out the latest prices and more details here. UPDATE August 2018: Looking for something not too big and not too small? Cotopaxi just released a “just right” version that falls between the Allpa 35L and the Nazca24L–meet the Cotopaxi Allpa 28L (I’m currently swooning over the gray color and trying to justify why I should have a third backpack-suitcase). It has the rugged material of the Allpa but a bit smaller size for shorter trips. Del Día Dopp Kit // I just picked one of these up recently, and I love how nicely it keeps all my toiletries snugly organized. It fits perfectly in the front pocket of the Allpa 35L. Agua Bottle // A reusable water bottle is SO handy for traveling and an easy way to cut down on plastic. While I don’t have a Cotopaxi one yet, I am in love with all the colors they have and plan to add one to my gear soon! Batac 16L Backpack or Luzon 18L Daypack // These are great to roll up and pack in your suitcase so you have a smaller pack for day trips or hikes on a weekend camping trip. I have both and find the Batac 16L to be a great size for my needs. What’s your favorite piece of travel gear or luggage? Is a suitcase-style backpack something you’d like to try? Let me know your questions & thoughts below! This post was originally published on December 7, 2017 and has been updated on February 20, 2018.